OrbitKit is a multi-POD design uploader with bulk edit capability. Here’s the quick list of what you need to know about OrbitKit (OK), and you can find more details and Frequently Asked Questions (FAQ) below. Cost: Not Free. There is a monthly fee for using this interface software, no lifetime plans. Learning Curve: Yes. Any new software takes time to learn and get it up and running. If you are already familiar with the connecting platforms, your learning curve will be shorter. 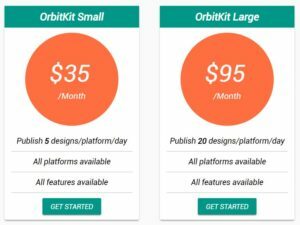 I am both an OrbitKit user and an affiliate promoter. OrbitKit founded by Jeff Schnitzer and Ray Vanderborght is software that allows you to post to multi PODs across the Internet, with a few button clicks. It’s all about building a system to save yourself time, energy, and money. One upload to all platforms. Reach more customers – more exposure – more sales. A win-win for all involved. The software is extremely user friendly. You will open accounts on all the Print on Demand platforms (if you have not already done so) and connect those to Orbit Kit. The software acts like a Virtual Assistant drip feeding new uploads to each platform on a daily basis. DIFFERENT BRANDS: No issue if you own multiple accounts for different brands. For example, you can connect two different Red Bubble accounts. Orbit Kit does not do any printing of products, so the staff’s time is purely focused on getting coding to work efficiently and reducing user clicks. The software is purely an Integration software connecting you to other websites. Group your designs by a niche or other relevancy (such as dark designs on light, kid designs, women only, etc.) These Groupings are referred to as Archeotypes by OK. I struggled a bit in the first month because I went with the strategy to get 1 of the platforms going and then, add another. I DO NOT recommend this. I recommend starting all platforms at the same time. Your biggest challenge will be deciding what size of your designs will work through OK to fit on all platforms. Choose 1 size and place it through all the templates, view it on the platforms and adjust. I thought I had a size that would work, only to find out later that 1 platform didn’t “like” that size. I’m a bit of a perfectionist in how my design lays, so this was very important to me. So I promise you, that you will save time by finding the size that works best on ALL platforms FIRST. To do that, you need to open accounts on all platforms and push the 1 design over to all, check it, and fine tune. Once that is done, your only focus will be designing, SEO, and collecting paychecks! What about the monthly fee? I worried about that too. People who know me, know that I absolutely try to avoid ALL monthly fees. I am a “lifetime” access type of person. But in the case of OrbitKit, they don’t have a lifetime deal. HOWEVER, they did just add a lower tier plan, so you can get in for only $35/month. This lower plan only adds 5 designs a day to each platform, but that is plenty for a new business owner. Those of you with a large inventory of designs, will want to get them uploaded faster and choose the higher plan. On either plan, with all the platforms opportunities for income, it should be pretty easy to quickly reach “break even point” if you max out your daily uploads, and soon after, you will just be collecting pure profit. Do I need to leave my computer running? No, OrbitKit is fully cloud-based. No, OrbitKit is month-to-month. You may cancel (or resubscribe) anytime and move between plan levels as needed (like maybe you will take a month vacation LOL). If I cancel, will my designs be taken down from the POD platforms? No, your designs belong to you! Once they are uploaded, you have full control over your POD accounts. No, but if for any reason you don’t love OrbitKit, they’ll refund you in the first 30 days. Just ask! Are my passwords and designs secure? Yes. OrbitKit is hosted by Google and its servers are secured by Google’s site reliability engineers. Access to your account is protected by Google authentication. Tech staff has decades of experience building secure enterprise-scale web applications. Can I upload grey-hat or IP infringing content? Can I import my gigantic spreadsheet/database/AirTable of metadata? Yes! CSV import process and if that doesn’t work, they’re happy to work with you on importing custom formats. They will even add specific coding to YOUR OrbitKit account personalized for your needs. Have more QUESTIONS on OrbitKit? Don’t worry. A Closed Facebook Group is included for all users. You can post your questions daily and get some hands-on help.